Here's a feel-good story about an Indianapolis couple who were in a famous photograph from 1957 and didn't know it. The photo appears in Robert Frank's collection The Americans, which has just been re-released in the past month or so. We're headed to Indianapolis this weekend, and with any luck we'll find time to see the exhibit mentioned in the article. One of the things I planned to do when Miriam was born was learn to play the guitar, but I haven't so much as picked one up in a year now. The other day I met some ukulele players and they taught me a few chords. It seemed easy, and now I'm contemplating getting one. 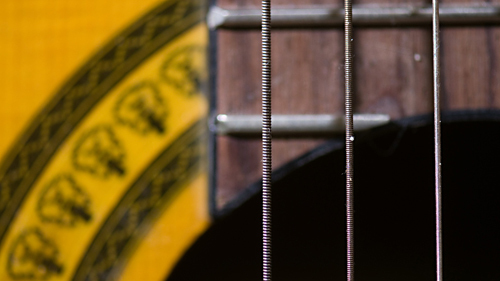 Maybe that will lead me back to these guitar strings. 1. It turns out displaying bumper stickers is correlated with more aggressive driving. More here. 2. Gregg Easterbrook has a fascinating/disturbing article on the chances that an asteroid will hit the earth and the policy implications of this problem. I don't know if it has any truth to it, but I was told by one of my political economy professors that Bill Clinton had a compulsive interest in near earth objects. "There are two flavor profiles in Mexican food," he says between bites of a taco at Don Pedro Carnitas: home food and street food. "Street food almost always has this super well-cooked fatty element in it that is completely balanced by straight, bright acid." He squeezes some lime on his taco. "When Mexicans go to Europe, they're just incredulous. There is nothing to balance all that heaviness. They consider it a really super one-dimensional cuisine. They're always reaching for a lime or a pickle or something -- an acid." He swallows, takes another bite. I actually bought a copy of the magazine (which is a pretty extreme move for me), and I was pleased to find that I was unfamiliar with the majority of the restaurants mentioned, even in neighborhoods I'd say I know reasonably well. Lots to try. The folks at Gapers Block used some of my photos to illustrate this nostalgic little piece by J. H. Palmer about Marie's Golden Cue near Kedzie and Montrose. You can see more of my photographs from pool halls here. Speaking of food production, yesterday Ezra Klein linked to a study showing that transportation is responsible for a much smaller portion of the greenhouse gas emissions related to food production than you might think. The conclusion there is that eating less meat (and dairy) will do much more to reduce greenhouse gas emissions than eating locally. If you haven't already seen the Mark Bittman talk on this subject, here's the link again. I am so impressed with Chipotle. We were there yesterday for the first time in a while and I noticed that all their meat is now hormone free and vegetarian fed. I don't know if that's a change or if it's just a change in the way they're promoting it. But anyway then I was reading the back of one of their soda cups and it explained that they've recently moved to the same kind of hormone free, vegetarian fed livestock for their sour cream as well. Of course, they don't make the sour cream themselves, so they had to work with their supplier, Daisy, to ensure that the livestock supplying their milk was hormone free and vegetarian fed. What interested me about this is that Daisy is a big name in sour cream -- one you can find at your local grocer -- and they were able to work something like this out for a high volume customer like Chipotle. I'm guessing this doesn't mean all of Daisy's sour cream is hormone free and vegetarian fed, mainly because they don't mention anything about it on their website and it seems like they'd want to if they could. Still, I think it illustrates the power of a high volume customer to insist on terms -- and in this case, terms that are better for our health and the environment. I remember reading some months ago about the Chipotle in Charlottesville VA working closely with a nearby farm to get pork that was locally raised. While the model seemed to be working in Charlottesville, there wasn't really any talk about scaling the relationship up, because there simply isn't enough capacity in locally produced pork to sustain the quantities eaten at a national chain like Chipotle. But what Chipotle does have is leverage -- leverage that could be used to change practices on a much larger scale, as they did with Daisy. I guess my takeaway from this is just that while the current food culture tends to demonize -- or at least frown upon -- large scale food production and its methods, that's where the action is going to have to be if society is going to change its eating habits. If you want to play some chess online but you're intimidated by the sharks at the Internet Chess Club (where some of the best players in the world are known to play), you might check out Wuchess.com. RZA of Wu-Tang fame is apparently a chess fanatic and wanted to create a place where fans of the Wu-Tang could go for a game. I picked this up on Gambit, the occasional chess blog at the Times, where you can review one of RZA's blitz games if you're interested. UPDATE: Guess I missed the full article that came out today. I linked to these tips on how to spot a fake photo a few weeks ago, but this article from Scientific American is much more thorough. 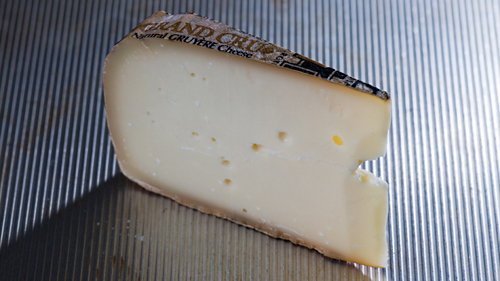 This week's cheese is the Grand Cru Gruyere from Roth Käse that I mentioned the other day; I actually had a chance to try both the regular offering and the Surchoix, their top label. I don't feel entirely comfortable comparing the two, since I ate them at different times and acquired them in different places. But it's easy enough to say that they were very similar; if anything the Surchoix may not have been quite as strong as the regular Grand Cru. I recommend them both happily, and I will seek them out again myself, both to eat and to turn into quiche. They were at least as good as any Swiss Gruyere I've had occasion to eat (although to be fair I've never looked much further than my local Dominick's). An aside: if you're planning to eat these cheeses by themselves (or with a bit of wine), I think it's worth letting them warm up to near room temperature first, because they get more flavorful. This is probably good advice for cheese in general, but I think it's especially true for this Grand Cru Gruyere. This is the archive page for June 2008. The main index is here; other archives can be found below.